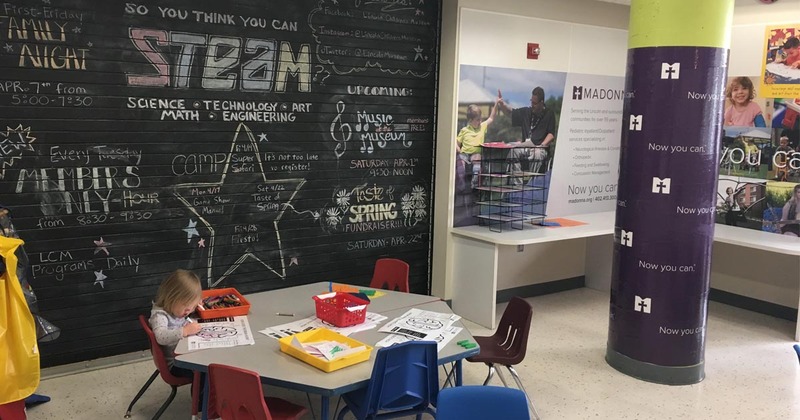 An exhibit at the Lincoln Children’s Museum provides a creative outlet to build awareness about Madonna’s specialized pediatric therapy program. Hands-on activities help educate children in being proactive about their safety to prevent injury. Throughout 2017, Madonna is sponsoring an exhibit at the Lincoln Children’s Museum to build awareness of Madonna’s pediatric therapy program. The goal is to educate children and their parents or caregivers on causes of acquired injuries, like brain trauma, spinal cord injuries and stroke. Each quarter focuses on a different topic with a hands-on activity, like making a seat belt bracelet with a reminder to “buckle up for safety.” The goal is to start a conversation with children in being proactive about safety to prevent injury. “It’s a fun learning opportunity for kids and a chance to promote our specialized pediatric therapy,” said Erin Reier, outpatient pediatric program leader. Upcoming activities include a coloring page explaining the right and left brain, creating a brain headband and a skeleton. Madonna’s ThinkFirst Chapter, which provides education to children on reducing risk for injury, will host an interactive day targeting brain injury and helmet safety. Visit www.lincolnchildrensmuseum.org for more information. Zachary LaPuma, (center) therapy aide, is the 2016 Georgann Claussen Award recipient at Madonna Rehabilitation Hospitals. Pictured (L to R) Rich Claussen, Bill Claussen and Madonna Lincoln Foundation Director of Development Suzanne Sughroue. College football rewards excellence on the gridiron with the Heisman Trophy. At Madonna Rehabilitation Hospitals, the Georgann Claussen Award recognizes excellence in patient care. Zachary LaPuma, therapy aide, received the honor in December 2016. Zachary affects patients of all ages, but especially the youngest ones. 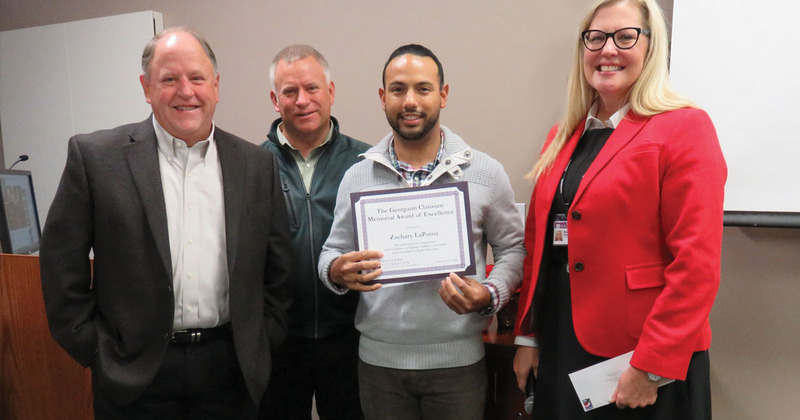 He was nominated by the Lincoln Campus outpatient pediatric team. “I feel very fortunate to work at Madonna and to be part of people’s lives and recovery,” said Zachary, who hopes to become a physical therapist. The Claussen Memorial Award, including a certificate and $250, is given annually to an outstanding Madonna caregiver who demonstrates compassion and excellence in helping children and adults with disabilities rebuild their lives. The award is named for Georgann Claussen, who was a patient at Madonna after a stroke in 1998. Georgann’s sons, Rich and Bill, designated Madonna as the beneficiary of a memorial in her name after her death in 1999. They asked that an annual award be created to honor a caring staff member. “I believe you are all angels on Earth,” said Rich. Rocky, the Angel Dog volunteer, with his handlers Mary Jane and Jim Fitch. “Hi. Would you like a visit from Rocky?” asked Jim Fitch. The “Rocky,” Jim Fitch is referring to, is a 3 ½ year-old four-legged pooch and Madonna’s newest Angel Dog volunteer. What’s unique about the golden retriever is the bright blue boot he wears on his front paw. Mary Jane says Rocky’s disability doesn’t slow him down and provides not only a conversation-starter, but inspiration to patients. Once a week he comes to the Omaha Campus to visit kids and adults. “When we adopted him from the Golden Retriever Rescue in Nebraska, we knew he was special. 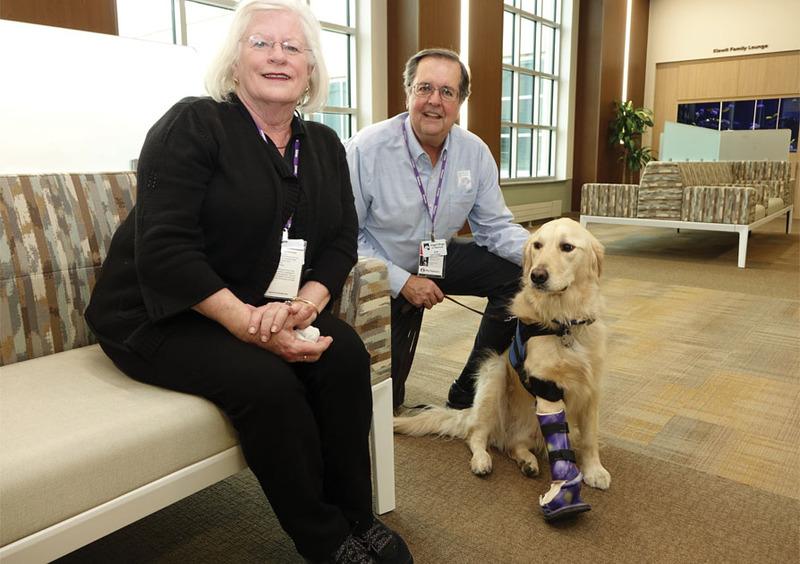 His calm temperament and friendly personality makes him a perfect therapy dog,” said Jim. “Seeing the joy Rocky brings to people makes it so rewarding for us,” said Mary Jane. Madonna is thankful to our four-legged friends and their handlers who work tirelessly to bring our mission to life through the Angel Dog program. To become a registered volunteer, Rocky and the Fitches underwent special training designed to prepare the volunteer to feel at ease working with their animal. The program works in conjunction with Pet Partners, a national not-for-profit organization that demonstrates and promotes animal-assisted therapy, activities and education. For information about how you and your dog can participate in the Angel Dog program, contact Marla Buresh, Madonna’s volunteer resources coordinator, at 402.413.4500. Patient Ruby Salazar shows her approval after a car seat fitting by Kristin Luethke, recreation therapist and child passenger safety instructor. Aidan’s Animals, an organization based in Bellevue, Nebraska, provides education and resources for child safety seats. Through their partnership with Madonna, Aidan’s has assisted many special needs children like Ruby by providing low or no-cost quality safety seats. 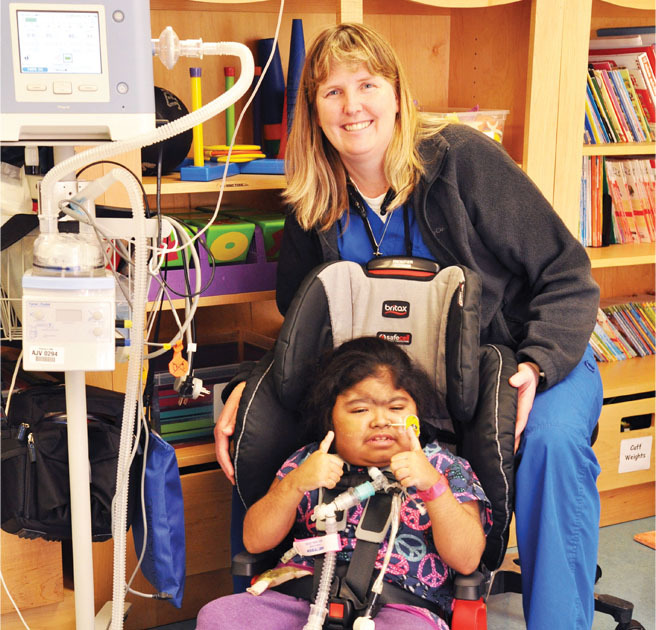 Madonna is grateful for their continued support of keeping pediatric patients safe. For more information on Karseats for Kids, visit supportaidansanimals.org. Haven Kmiec of Topeka, Kansas, and Gabby Holthe of Jackson, Minnesota, share a love of horses. They met in the brain injury recovery program at Madonna’s Lincoln Campus. 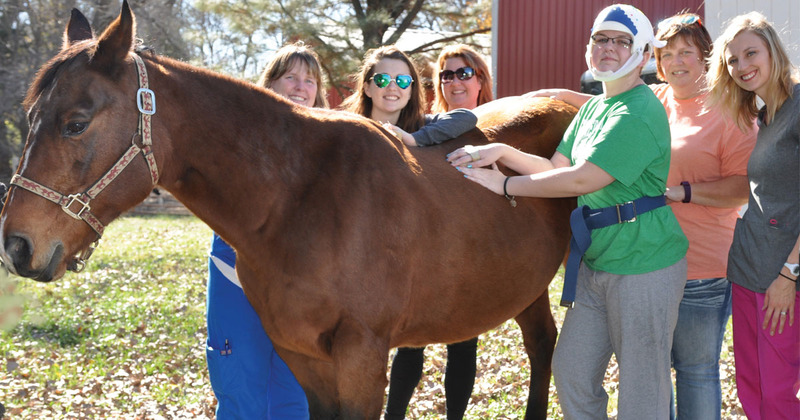 An outing, arranged by their therapists, to Windsong Equitherapy in Lincoln, recharged the cowgirls. (L to R) Kristin Luethke, Haven, Michelle Kmiec, Gabrielle, Cathy Holthe and Jessica Virgil.